President Trump announced Thursday he is nominating Alexander Acosta as secretary of labor, moving fast to bounce back from Andrew Puzder’s failed nomination. Acosta, the son of Cuban immigrants, is an experienced former government employee, having served on the National Labor Relations Board, led the civil-rights division of the Justice Department, and served as a U.S. Attorney for the Southern District of Florida during the George W. Bush administration. If confirmed, he will give the Trump Cabinet its first Hispanic appointee. Acosta served as a law clerk to current Supreme Court Justice Samuel Alito when Alito was serving as a federal appellate judge. Acosta is currently the dean of the law school at Florida International University. Trump announced the appointment with an unusually brief, vague comment at the start of a White House press conference Thursday afternoon. Acosta was not present. Trump wasted little time in announcing Acosta’s appointment, which came less than 24 hours after the withdrawal of Puzder, who is chief executive of the parent company of Hardee’s and Carl’s Jr. His nomination, already looking troubled, collapsed Wednesday when it became clear that too many Republicans refused to support his nomination. Trump did not make so much as a statement about Puzder’s departure. The speed raises questions about the White House nomination process—Puzder, after all, seems to have been insufficiently vetted. But Acosta looks like a much safer, more conventional pick than most of Trump’s nominees, and crucially, he has already been confirmed by the Senate for previous posts, which usually indicates a smoother process. Acosta’s most immediately applicable resume line seems to be his service on the NLRB, which ran for approximately nine months between December 2002 and August 2003. The board, an independent federal agency with members appointed by the president, oversees issues like collective bargaining and union disputes. Nonetheless, his stint at the Justice Department will likely be a locus of criticism for Democrats. The Bush Justice Department, and particularly the Civil Rights Division, were shaken by a scandal over improper politicization of the hiring process, as well as unlawful firings of U.S. attorneys. 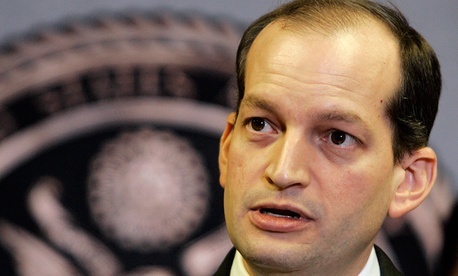 Acosta’s deputy was Bradley Schlozman. A Justice inspector general’s report “found that Schlozman inappropriately considered political and ideological affiliations in hiring experienced attorneys in the sections he supervised and entry-level attorneys throughout the Division for the Attorney General’s Honors Program.” Acosta denied knowledge of Schlozman’s transgressions, though some colleagues disputed that. In 2005, President Bush appointed Acosta U.S. Attorney in Florida’s southern district, which includes Miami, Fort Lauderdale, and Key West. Among his notable prosecutions were the disgraced lobbyist Jack Abramoff and aspiring terrorist Jose Padilla. He also extracted a $780 million fine from UBS, the Swiss bank, in a fraud and conspiracy case. In 2009, Acosta became dean of law at FIU. It is tempting, if premature, to view Acosta’s appointment as the beginning of a course correction toward a more cautious, traditional appointment process at the White House. Former National Security Adviser Michael Flynn, forced out this week for misrepresenting conversations with the Russian ambassador, had been seen by some corners of the national-security establishment as something of a wild-eyed conspiracy theorist. The reported frontrunner for his old post, Admiral Robert Harward, is a respected, sober figure. In lieu of Puzder, whose nomination fell apart amid questions about hiring of illegal immigrants and decades-old allegations of spousal abuse, Trump is selecting a well-respected public servant—a conservative pick in the non-political sense of the word. Acosta is unlikely to win the hearts and minds of Democrats, but he will make a much more difficult target for them, and he should find support among congressional Republicans disconcerted by the rocky start to the Trump administration.